Unidentified airstrikes have killed 12 civilians in an opposition-held pocket of southern Syria as regime ally Russia presses talks for Damascus to retake the area, a monitor said Wednesday. 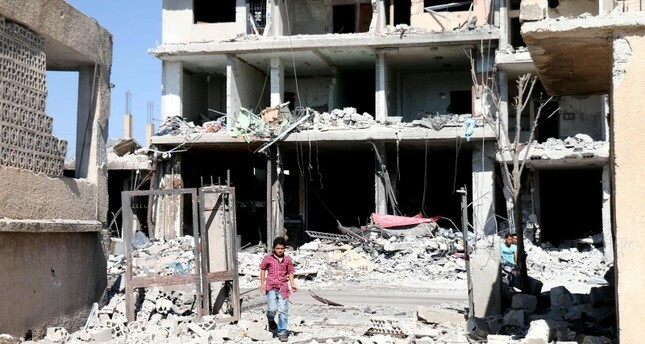 The deadly strikes late Tuesday hit Nawa, the last town under opposition control in the southern province of Daraa, the Syrian Observatory for Human Rights said. The Britain-based monitor said it could not determine whether the strikes on the town in the west of the province were carried out by the regime or its Russian ally. The regime has in less than a month retaken more than 90 percent of Daraa province, which borders Jordan and was the cradle of Syria's ill-fated 2011 uprising. But opposition fighters in Nawa -- where tens of thousands of people live -- have resisted. After regime forces launched a ferocious offensive on June 19, Russia pressured opposition fighters to hand over eastern parts of the province in early July, and the provincial capital last week. Other towns in the west of the province have also joined the deal. "Negotiations were ongoing Wednesday towards Nawa joining the reconciliation deal" with the regime for the wider province, Observatory head Rami Abdel Rahman said. A ceasefire deal announced earlier this month between the regime and opposition in Daraa province did not include terrorists. On Wednesday, Russian airstrikes and regime barrel bombs targeted hills outside Nawa held by the Hayat Tahrir al-Sham group, led by Syria's former Al-Qaeda affiliate. Heavy air strikes also pounded a southwestern corner of the province controlled by the Daesh terror group. After retaking most of Daraa, regime forces on Sunday opened a new front in the neighboring province of Quneitra, adjacent to the Israeli-occupied Golan Heights. Earlier on Tuesday, 15 civilians were killed in strikes in both provinces, including 14 in Ain al-Tina village on the administrative border with Quneitra. Syria's conflict has killed more than 350,000 people since it started in 2011 with a brutal crackdown on anti-regime protests.